You know, sometimes there are games (or shows or whatever) that you’re not entirely sure exist. You remember playing them, you remember owning them… But nobody else knows about it. Chameleon Twist is that kind of game. I’m not entirely sure what drew me to Chameleon Twist. I only saw a short article in an old Nintendo Power as a kid, but the idea of using this big ol’ tongue to fight and solve puzzles (and the fact that you play as a chameleon-turned-vaguely-humanoid) blew my young mind. The game was just… so uniquely Japanese. In a time when games were beginning to become more serious and dark with stuff like Turok and Symphony of the Night, Chameleon Twist was okay with being silly. I mean, one of the levels was called Kids Land and had floating cookies and stuff for enemies! of those games that reminds me why I play video games in the first place. I know this is shorter than these retrospectives tend to be, but… Chameleon Twist isn’t really something I can explain. People who’ve played it know what I’m talking about (hopefully), but for everyone else. If you get the chance, give Chameleon Twist a shot. Even if you don’t care for it, you’re likely to never find another game like it. … Except for the sequel, anyway. Anyway, as always, thanks for reading and have a good’un. 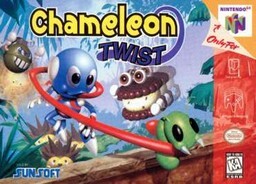 This entry was posted in Looking Back, Video Games and tagged chameleon twist, chameleon twist game, chameleon twist n64, chameleon twist retrospective. Bookmark the permalink. If you ever find it (and it’s not too expensive/you own a 64), definitely give it a shot. Or you could emulate it. I don’t normally just recommend that, but… well, Sunsoft sure as hell isn’t going to be making money off the used copies. And yeah, the cover was in an ad a few issues before the review! It was love at first sight. And confusion. Mostly confusion, really. Oh man, I remember renting this out at Blockbuster (when it existed back then) and I could never get past the 2nd level. I remember it being a big deal to actually see a Blockbuster as a kid. Never rented anything (few hours away and all that), though. And this game was all about how awesome it was to be a chameleon. … or probably not, but it’s the best joke I could make on short notice while being half-awake. Thanks for reading and the comment!